It’s Advent, the time of year that we prepare not only to celebrate Christ’s birth but also for Christ coming anew into our hearts and our troubled world. While Christmas is a time of great joy, Advent’s more solemn observances—reading Scripture, reflecting our life and times, penitence—prepare us for Christmas and make fresh our yearning for Christ and heartfelt call: O Come, O Come, Emmanuel! In this issue, United Methodist Deaconess M. Garlinda Burton’s Advent Bible study heralds the invaluable supportive role of “background singers” in God’s mission story. People like Elizabeth. People like United Methodist Women members. As always, this month’s “live” section shines a light on local and district United Methodist Women’s faithful and unsung outreach that is mission and makes wider mission possible around the world. In the “listen” section, Church Center for the United Nations chaplain, the Rev. Dionne P. Boissère, invites readers to reflect and prepare for year of mission outreach by keeping an Advent journal. And as we prepare to celebrate the birth of a the Christ child, this issue takes a look at Henderson Settlement’s Maternal Infant Health Outreach Worker program, which is receiving support from United Methodist Women’s new maternal health initiative with the United Methodist Committee on Relief. We consider the things that will make for peace in Bethlehem, where the Rev. Alex Awad, United Methodist mission and dean of students at Bethlehem Bible College, writes about life under Israeli occupation. Finally, this issue features the 2015 United Methodist Women Reading Program, a mission education program that can also be a source for mission-minded Christmas gifts. 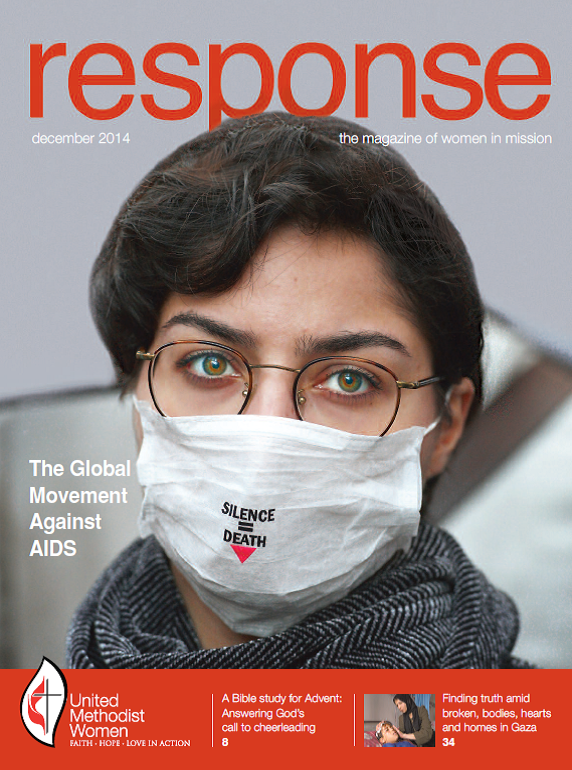 This issue of response comes with hope and prayers that it will assist you in getting ready from within to again step out in faith for mission with women, children and youth in your local community, area and world with United Methodist Women. This entry was posted in From the Editor, Reading Program. Bookmark the permalink. I would like to send items of interest from Oak Grove United Methodist Women. How can I accomplish this? vickygraves@bellsouth.net. We just completed our UMW installation of officers and also have photos I’d like to submit for your magazine! Hi Vicky! We’d love to share your story. I’ll be sending you an e-mail momentarily.